Sight is arguably our most important sense; we rely upon it to navigate through our surroundings with ease. Loss of vision can have a huge impact on a person’s life, but many of the disorders that cause blindness are currently difficult or impossible to treat. Researchers are now using stem cell technology to explore possible new approaches to treatments for loss of vision. Treatments for most disorders that cause vision loss are difficult or not yet possible. Specialised cells in the eye serve specific functions to focus light and turn what is being seen into signals sent to the brain. The eye contains several types of stem cells that constantly replace specialised cell that become worn out or damaged. Holoclar® is currently the only clinically approved stem cell treatment for the eye. This treatment restores vision to patients with damaged corneas (the clear outermost part of the eye) by transplanting lab-grown limbal stem cells into areas of the eye lacking these cells. Holoclar® only works if people have some limbal stem cells left in their eyes for clinical labs to grow. New methods of making limbal cells with pluripotent stem cells are being developed for people without any limbal stem cells left. Researchers are studying how transplants of retinal pigment epithelial cells made with pluripotent stem cells might prevent vision loss in patients with diseases such as age-related macular degeneration. Researchers are also using stem cells to study many different aspects of the eye, from how the eye is made to what causes eye diseases and how to treat them. Many diseases that cause blindness are still not treatable. Researchers are working to understand what causes these diseases, what other types of stem cells reside in the eye and how stem cells might be used to repair or even restore vision to patients. Many of these studies are still in the early years. Just as Holoclar® took more than twenty years to develop into a safe and successful treatment, today’s research and discoveries will take time to develop into safe and reliable treatments for other types of blindness. The eye is the organ responsible for our ability to see the world around us. It is able to detect light from the surrounding environment and transfer information about what it has detected to the brain. It is a very complex organ made up of multiple, specialized components, not unlike an electronic camera. The components, or tissues, are made up of many types of cells, each with a specific job to do to enable the tissues to perform specialized roles. The eye: A complex organ made up of layers of different cell types. Cornea The transparent ‘window’ on the front of the eye that allows the light to enter. Lens Acts just like a lens in a camera by focusing the light that enters the eye. Retina The electrical circuit at the back of the eye that is responsible for seeing. It is the most complex component of the eye and is made up of several different types of cells with specific roles. These include the photoreceptor cells, which detect the light entering the eye and produce an electrical signal. Optic nerve A biological wire that connects the eye to the brain. It is responsible for transferring the electrical signal produced in the retina to the brain. The brain then interprets this signal to give us a picture of our environment. The optic nerve is closely associated with the retina. Retinal pigment epithelium A sheet of black cells that sit beneath the retina. This sheet supports the retina and has a number of important roles, including processing nutrients. Disorders or diseases of the eye occur when one or more of these components is damaged, and/or stops working properly. Different disorders develop depending upon which component(s) are not working. The difficulty in treating these problems is that, unlike the electronic parts of a camera, new biological components for the eye are not easy to obtain. This is where stem cell technology may be of use. Stem cells can act as a source of new, healthy specialized cells and may provide a way to replace damaged cells in the eye. There are several types of stem cells that could be used in different ways, depending upon the particular disorder to be treated. So what is current research focused on? Limbal stem cells from the human cornea, with a protein known as p63 stained yellow. Cell nuclei (which hold the DNA) are stained red. Cells that make up the cornea (the window part of the eye) are constantly damaged by blinking and exposure to the outside world. To repair this damage, we have a small number of stem cells at the edge of the cornea, known as limbal stem cells. They are responsible for making new corneal cells to replace damaged ones. If these stem cells are lost due to injury or disease, the cornea can no longer be repaired. This affects the ability of light to enter the eye, resulting in a significant loss of vision. Following many years of painstaking research, scientists have now developed a technique whereby limbal stem cells are collected from an adequately healthy donor eye, or from a spared limbal area in bilateral lesions, are expanded in the laboratory to sufficient numbers and transplanted into the damaged eye. Clinical trials have shown that transplantation of limbal stem cells from a healthy eye can repair the cornea and permanantly restore vision. 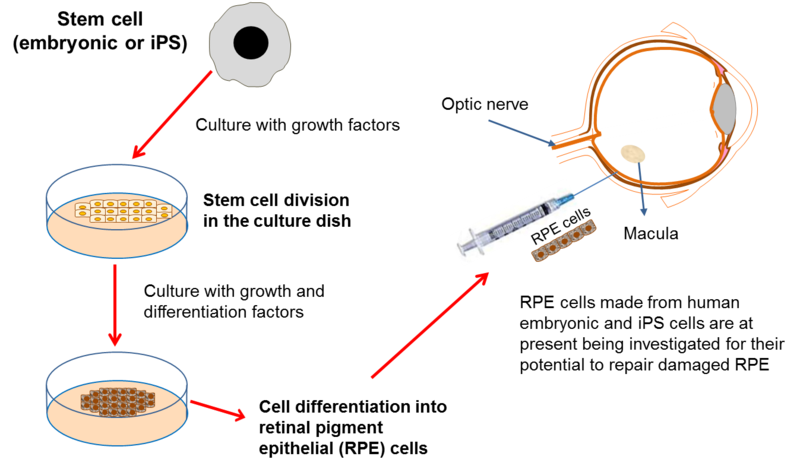 In order to avoid immune rejection this treatment only works if the patient has a healthy section of limbus from which to collect the limbal stem cells. Repairing the cornea: Currently the only stem-cell-based therapy for the eye that has been proven to work in clinical trials. At present, this is the only available stem cell treatment in the eye that has been proven by clinical trials to work. In 2015, the European Commission gave authorization (following approval by the European Medicines Agency) for an advanced therapy medical product (ATMP) containing limbal stem cells to be marketed to healthcare providers. This is the final step in the clinical translation process happening after successful clinical trials. The therapy, called Holoclar®, is based on more than twenty years of excellence in research, conducted by a team of internationally renowned scientists in the field of epithelial stem cell biology. It is produced in GMP (Good Manufacturing Practice)-certified facilities in line with European legislation, by an Italian University spin-out company called Holostem Terapie Avanzate S.r.l and commercialised by Chiesi Farmaceutici S.p.a. In the situation where the corneas of both eyes are badly injured (bilateral limbal deficiency), this therapy will not work as there is no residual limbal stem cells available to culture. For this challenge, researchers are currently investigating the possibility of using a different approach – using embryonic stem cells or induced pluripotent stem (iPS) cells or oral mucosa stem cells - to make new limbal stem cells in the lab. This could remove the need for complex surgery to collect limbal stem cells, as well as providing a theoretically endless source of large quantities of limbal stem cells for patients who require new ones. It is hoped that this kind of approach will be available for patients in the future. One way to treat these diseases would be to replace the damaged RPE cells with transplanted healthy cells. Unfortunately, it is not possible to take healthy RPE cells from donors so it is necessary to find another source of cells for transplantation. Scientists have recently produced new RPE cells from both embryonic stem cells and iPS cells in the lab. The safety of embryonic stem cell-derived RPE cells has been tested in phase I/II clinical trials for patients with Stargardt’s macular dystrophy, and for thse affected by AMD by a stem cell biotech company called Advanced Cell Technologies. The results of the trial, published in 2014, demonstrated safety and showed engraftment of the transplanted RPE cells. However, some participants experienced adverse side effects from the immunosuppression and the transplantation procedure itself. Interestingly, despite not being an endpoint of this trial, several patients also reported an improvement in vision. A second Phase I/II trial exploring the use of RPEs derived from human embryonic stem cells for people with wet AMD is currently underway in the United Kingdom. The first patient received their transplant in September 2015. This work, led by Prof Pete Coffey, is ongoing and is being carried out at Moorfields Eye Hospital as part of the London Project to Cure Blindness. Finally, Japanese researcher, Dr Masayo Takahashi is leading a clinical trial in Japan which transplants RPE cells made from iPS cells into patients with wet AMD. The trial was put on hold for several months due to regulatory changes in Japan and concerns about mutations in an iPS cell product to be used in the trial. The trial has recommenced June 2016 and many await the results. There are several other phase I or I/II clinical trials using pluripotent stem cells world-wideinvolving small numbers of participants. These trials are examining primarily the safety, but in some cases also the effectiveness, of the use of RPEs developed from pluripotent stem cells in dry and wet AMD and Stargardt’s macular degeneration. Replacement of damaged RPE cells will only be effective in patients who still have at least part of a working retina, and therefore some level of vision (i.e. at early stages of the disease). This is because the RPE cells are not themselves responsible for ‘seeing’, but are actually responsible for supporting the ‘seeing’ retina. Sight is lost in these types of diseases when the retina begins to degenerate because the RPE cells are not doing their job properly. So the RPE cells need to be replaced in time for them to support a retina that is still working. It is hoped that transplantation of new RPE cells will then permanently halt further loss of vision, and in some cases may even improve vision to some degree. In many of the cases where vision is lost, we often find that the problem lies with malfunctioning retinal circuitry. Different disorders occur when particular, specialized cells in the circuit either stop working properly or die off. Despite the retina being more complicated than other components of the eye, it is hoped that if a source of new retinal cells can be found, we may be able to replace the damaged or dying cells to repair the retina. In addition, this approach may also help to repair damage caused to the optic nerve. Again, scientists have turned to stem cell technology to provide the source of replacement cells. Several studies have now reported that both embryonic stem cells and iPS cells can be turned into different types of retinal cells in the lab. 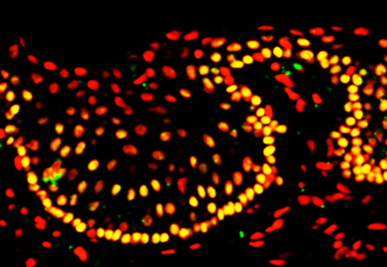 Within the eye, a type of cell called the Müller cell, which is found in the retina, is known to act as a stem cell in some species, such as the zebra fish. It has been suggested that this cell may also be able to act as a stem cell in humans, in which case it may provide another source of retinal cells for repair of the retina. Unlike RPE cell transplantation, direct repair of the retina may allow patients who have already lost their vision to have it restored to some degree. This gives hope for patients with disorders like late-stage age-related macular degeneration, where the light-sensitive photoreceptor cells in the retina have already been lost. This type of research may also provide new treatments for people who suffer from retinal diseases like retinitis pigmentosa and glaucoma. However, despite encouraging evidence, such research is very much in its infancy. There are currently no patient clinical trials planned using this type of approach, as significant further research is still required first. Replacing the nerve cells of the retina: Current research aims to understand how to produce retinal nerve cells that could be used in future therapies. Stem cell technology holds great potential for improving the lives of people who suffer from visual disorders. A number of studies are currently being undertaken in order to develop new therapies to treat, and/or prevent a loss of vision. Central to this research is the development of our understanding of how different types of stem cells behave, and how best to harness their potential in the eye. A tailored approach is required, dependent upon the particular problem a patient is experiencing. 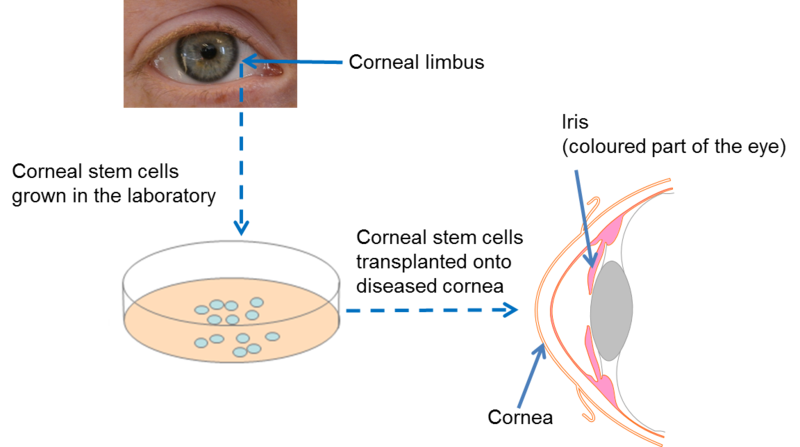 Stem cells are not a one-stop, generic cure, but they do hold exciting potential for the production of new biological components that can be used to repair the eye. This factsheet was created by G. Astrid Limb, Silke Becker and Matt Smart. Fact sheet reviewed by Pete Coffey with input on information about repair of the cornea from Michele de Luca. Images of limbal epithelial stem cells and picture showing the use of embryonic/iPS cells by Dr Hannah Levis and Dr Amanda Carr, respectively, UCL Institute of Ophthalmology. All other images from the laboratory of Astrid Limb. Blinking damages the surface of your eyes, but you do it about 12 times per minute. It's a good thing your eyes have stem cells to repair the damage! 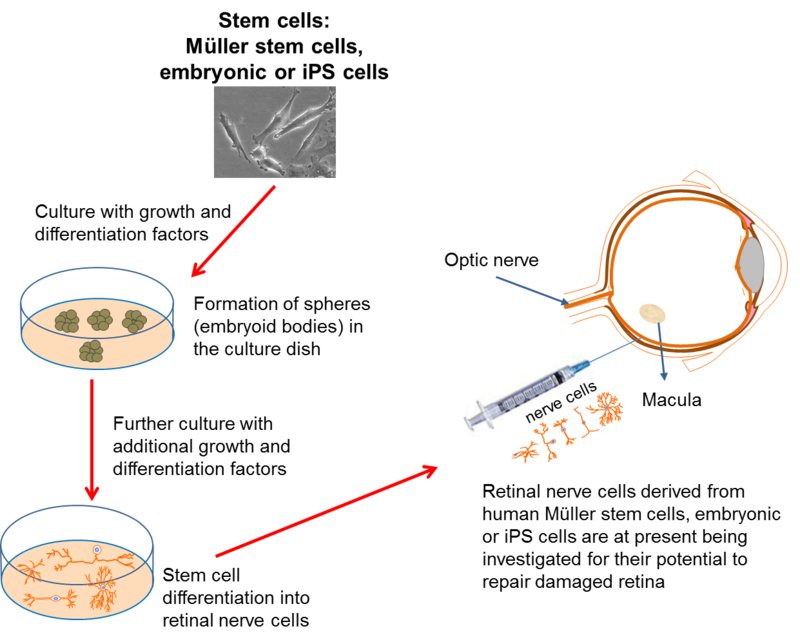 Adding the right growth factors to Müller stem cells can make them become retinal nerve cells, as shown by the presence of a protein known as Islet 1 (pink). Retinal nerve cells made from Müller stem cells (green) can move into the retinal nerve layers (blue) when transplanted into a rat eye with retinal damage.